After a hiatus of two years, Bettie Champion will again be helping Gulf Coast residents learn about their food heritage by offering The Gumbo Academy. The Alabama Arts Council has awarded Bettie a grant to help facilitate the two-part class. The lecture portion of the class will be held on Monday, Feb. 22, or Tuesday, Feb. 23 beginning at 5:30 p.m. at Government Street United Methodist Church. Experienced or novice cooks can learn to make a basic seafood gumbo with shrimp and crabmeat from someone who knows how it is done. The first class (held on the previously mentioned dates) will be a lecture covering gumbo history, preparation and instruction. Participants will receive informational handouts, including the tried-and-true recipe so many have come to love. The second class is the hands-on part. After the initial lecture, students will be scheduled in pairs at their convenience for the cooking portion of this course. As you would imagine, it begins with a roux and ends with a full gallon of completed gumbo to take home to the family. The best part is all you need to bring to the cooking session is a pot, as all ingredients will be provided. Cost for the two classes is $75. Sign up early so you don’t miss out. For more information, contact Bettie Champion at championbettie@hotmail.com or call 251-458-1570. Maybe you have been given some sort of horrible medical news that you must give up bacon. The horror! Maybe you are allergic to the other white meat. Maybe you have a religious excuse to not dine on the swine. Whatever the case for your abstaining from the heralded breakfast protein, salad topper, grease renderer or jalapeño wrapper, there is good news: We may have found a real all-meat substitute. Not everyone can enjoy pork bacon. And though turkey bacon may be promoted as healthier, it isn’t as flavorful. Well mooove over, old-school bacon. We ain’t fakin’. Try SCHMACON, the beef alternative to what made the BLT famous. Made from whole-muscle beef, SCHMACON is seasoned to taste like bacon only beefier (of course) and boasts lower sodium, fat and calories. It is smoked, not cured, so the preparation only requires a bit of crisping in the oven, griddle or microwave as it is essentially already fully cooked. The product is slowly making its way to grocery stores nationwide but has yet to reach any I’ve found. The best way to try this Illinois creation is by purchasing it online. I know many of you need something to dress up your post Super Bowl Bloody Mary drinks. Those cream cheese jalapeños aren’t going to wrap themselves. So if you have been denied the pleasure, or maybe just want to try something different, order online at www.schmacon.com. With the closing of Wintzell’s in the Eastern Shore Center, Spanish Fort had a void for where to get great oysters. Enter Half Shell Oyster House, to the rescue! That same building has been transformed and you would not recognize it. The new location opened Monday with a bang and will be sure to gain regulars along the way with its well-established menu, monthly specials and elegant happy-hour cocktails. Hours are Monday through Thursday 11 a.m. until 10 p.m.; Friday and Saturday they close at 11 p.m., and Sunday they cut you off at 9 p.m., with brunch served until 2 p.m. It’s a tasty way to dress up that Malbis intersection. Yes, it is a huge beer spot downtown at the corner of Joachim and Dauphin streets, but LoDa Bier Garten has some righteous food as well. It’s become famous for its burgers, as it should, by using fresh — never frozen — ground chuck from Mosley’s Meats. And while “The Defibrillator Challenge” sports four of these half-pound patties, you’ll find me sticking to the side of the menu with the regular burgers. 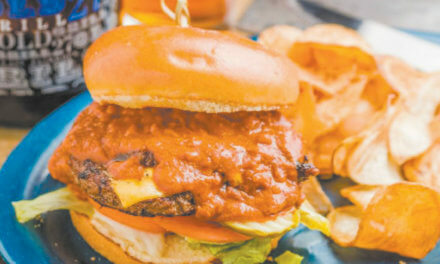 Gaining in popularity is the bison burger ($22), available only Thursday through Sunday, but the latest news is the “build your own burger” ($9) special on Monday nights. With a German name, LoDa Bier Garten had to offer schnitzel and brats, but has gotten a little crazy with more Southern offerings such as “Pig on a Stick,” which are bacon-wrapped Conecuh sausage corn dogs fried and served with honey Dijonnaise. Stop in and check out the new menu items before Mardi Gras packs out the place. Fans of Chuck’s Fish of Tuscaloosa/Birmingham fame will be happy to know they are branching out. Check out the Real Deal column on Page 16 of this issue of Lagniappe for more information, and visit www.chucksfish.com for a sneak peek at the menu.